Unimore is one of the main players of IMPROVE, a project financed by the EU Horizon 2020 project for an amount of 4.2 million euros. Closed on 31 August 2018, the project is one of the flagship Industry 4.0 European initiatives, with the purpose of creating a virtual factory of the future, able to provide support services to users; more specifically in terms of optimisation and monitoring, thus allowing to detect abnormal behaviour and prevent inefficiencies in the manufacturing phase. The project results apply to four major areas: simulation and optimisation, condition monitoring, alarm management and qualitative forecast. The contribution by Unimore was also possible thanks to the Automation, Robotics and System Control Lab research team (www.arscontrol.unimore.it) of DISMI - Department of Science and Methods of Engineering, which was in charge of the simulation and optimisation tasks and made it possible to achieve one of the main results of the project, that is the operators training through the use of augmented reality. This helped make quality forecasts, optimise the energy consumption and simulate a role shift. 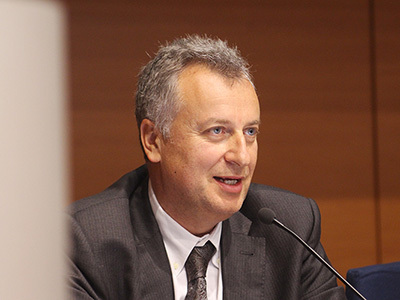 Professor Cesare Fantuzzi of DISMI was the local coordinator of the project. IMPROVE solutions may be standardised, traded, made accessible and applicable for the European small and medium businesses, by dealing with the issue of user support functions in terms of self-diagnostics (condition monitoring, predictive maintenance) and self-optimisation (energy optimisation). Professor Cesare Fantuzzi commented: This project, in which Unimore plays a primary role, forms part of the highest level activities in industrial research within the Industry field. Thanks to the results of this European project, the technologies of simulation and optimisation of resources (e.g. energy consumption) will improve the manufacturing processes in terms of what Industry 4.0 outlined for EU industrial competitiveness and sustainability. The IMPROVE project brought together the forces of 13 main players of the industrial and academic world, in particular the universities HS-OWL, ISOB, TUM (Germany), Unimore (Italy), Marmaris (Turkey) and the businesses Reicofil, Brückner, Eurice (Germany), Arcelink (Turkey), Ocme (Italy), TT (Poland), B&R (Austria) and Xcelgo (Denmark).